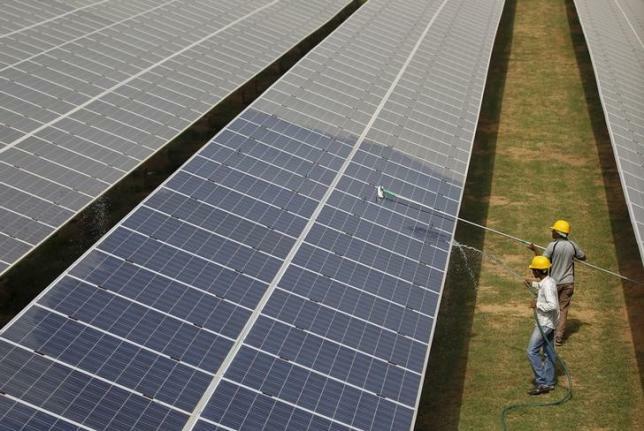 U.S.-based SunEdison has won a bid to sell solar power in India at a record low tariff, which could boost the appeal of the renewable source at a time when Prime Minister Narendra Modi is pushing for clean energy to combat climate change. Solar energy still has a long way to go before it can effectively compete with coal, given questions over consistent supply and transmission. But falling rates could unlock more government support for solar and wind energy. Modi’s government expects clean energy to yield business worth $160 billion in India in the next five years, and established U.S. companies like SunEdison and First Solar Inc are likely to be the biggest beneficiaries. SunEdison won the auction for a 500 megawatt project in Andhra Pradesh, bidding to supply power at 4.63 rupees ($0.0706) per kilowatt-hour, Upendra Tripathy, new and renewable energy secretary, told Reuters on Wednesday. Maryland Heights, Missouri-based SunEdison did not immediately reply to requests for comment. “Delighted that an all time low solar tariff … has been achieved during reverse e-auction conducted by NTPC,” tweeted power, coal and renewable energy minister Piyush Goyal, referring to India’s biggest power utility. The previous lowest solar tariff in India was about 5.05 rupees per kilowatt-hour for Canadian company SkyPower’s project in Madhya Pradesh state in central India. Coal power costs anywhere between 1.5 rupees to 5 rupees, according to a government official who declined to be named. India is providing cheap loans to set up solar projects and helping companies buy land to meet its ambitious target of multiplying renewable energy generation to 175 gigawatts by 2020. Solar energy is targeted to leap five-fold to 100 gigawatts. The country is relying on renewables to fight climate change rather than committing to emission cuts like China, arguing that any target could hinder economic growth vital to lifting millions of its people out of poverty. Deep-pocketed investors like Japan’s Softbank and iPhone maker Foxconn have already pledged to invest about $20 billion in solar projects in India. Previous Previous post: Drinking Water from thin air ?